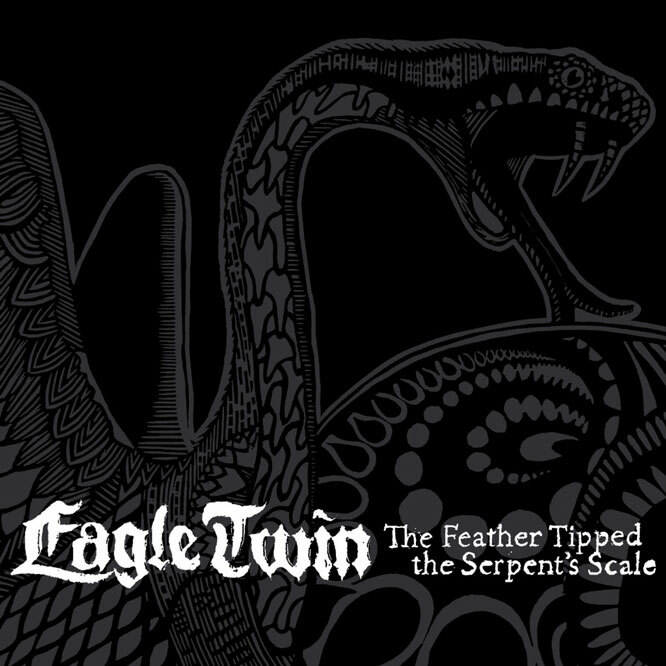 The Feather Tipped the Serpent’s Scale, the new opus from Salt Lake Citys heaviest duo EAGLE TWIN picks up right where the band’s acclaimed debut LP The Unkindness of Crowsleft off. In this installment the crows documented in the first album have battled the sun and were burned back down to earth as black snakes, the concept of the album continuing mainly on the snake and its various mythic and symbolic incarnations. Ultimately the great ancestral snake is transformed from its lowly beginnings back into a bird soaring upon the thermals. Recorded with Randall Dunn London Bridge Studio, also as with the first album, the record boasts some of the most mesmerizing and monstrous riff transformations from EAGLE TWIN to date. Another must have for forward-thinking riff-seekers!